The drive to chase and catch prey is what makes dogs play tug-of-war and chase a ball. But make no mistake -- under that playfulness, your dog is a natural-born hunter. 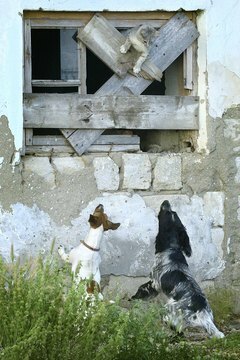 And some dogs have a high prey drive that makes them dangerous to cats, even if they're just playing. Most house dogs will live comfortably with cats, and typically any chasing is an attempt at play. But even this can be dangerous. A cat will not necessarily understand that the dog is playing and may fight or flee in defense. These actions could trigger a fight that becomes violent, or in dogs with strong chase drives, like most hounds and terriers, set off an unintended hunt. The best defense against your dog chasing and harming a cat is to raise him with cats before he's 3 months old. Usually, a puppy will want to play with the cats, who may not share his enthusiasm. It's important not to intervene in any altercations unless serious aggression or injury occur, as the cat's defensiveness will teach the puppy his boundaries and make him less likely to mess with other cats later. If your dog has killed a cat and continues to chase after them, it is best to keep the dog within an open, fenced-in area alone. If that's not possible, keep your dog in a large kennel area. This also prevents your dog from packing with other loose dogs, which fosters aggressive behavior. Also, be aware when walking your dog that cats are nocturnal and most active after dusk and before dawn. Avoid walking a predatory dog at these times or in areas where you know cats are likely to be, if possible. Always make sure you keep your dog on a leash and that you can maintain control of him. A dog who kills a cat is not being a bad dog, he is following his instincts. Even if tragedy occurs, never hit or punish your dog for killing a cat, he will not understand and it may make his aggressive behavior worse. Do not let your dog chase and catch cats in hopes that the cat will get away or teach the dog a lesson. It might not work out the way you want, and one or both animals could get hurt if they run into the street or a cluttered area. Hunt and play are similar but very distinct frames of mind for a dog. Leash your dog and play with him outside, with toys, teaching commands to come and stay. Do this regularly for a month. When a dog learns outdoor play and commands, he will be less distracted by small animals and will listen when you tell him to come back to you before he chases a cat too far. It may be best to hire a certified trainer to teach your dog how to redirect his energies away from prey and toward play. A dog's sensory environment and prey drive are driven by scent first and sound second. If your dog associates chasing or catching cats with an obnoxious odor from a spray or with a harsh noise, he may stop chasing. Always work with a certified trainer for this approach, however, to ensure the right level of discomfort without harming the dog or any cats. What do Black Panther Cats Eat? Do Lions Have Good Senses?